A medium sized smoker which measures 11cm in diameter x 27cm high. 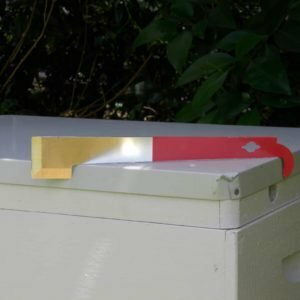 The external shield offers protection to the beekeeper from the hot smoker. Have you ever wondered why beekeepers use smoke when working with honey bees? Smoke has been used to calm bees for thousands of years, and the remains of smoking pots have been found amongst artefacts from ancient Greece. The traditional explanation for the effectiveness of smokers hinges upon the fact that the smoke triggers a feeding response in the bees, as they prepare for the possibility that they must abandon the hive due to fire. Their abdomens become distended from consuming honey, and this makes it difficult for the bees to flex sufficiently to sting. 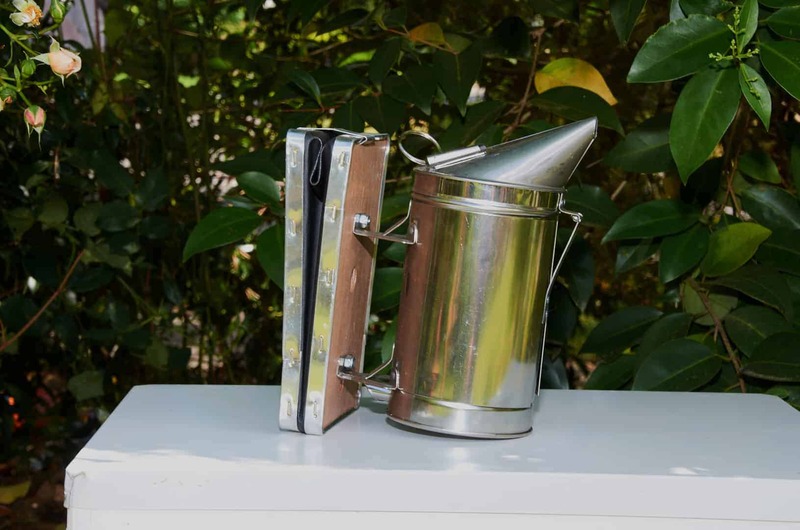 More recently, it has been discovered that smoke masks alarm pheromones released by sentries or when bees are injured, thereby neutralising the colony’s defensive response and creating an ideal opportunity for the beekeeper to work on the hive. Smoke is of limited usefulness with swarms as they do not have reserves of honey to feed upon. However, swarms have no nest and are consequently far less defensive in nature. The invention of the modern handheld bee smoker (or smoker) is attributed to Moses Quinby, the first commercial beekeeper in the US, in 1875. The smoke is produced by incomplete combustion of a variety of fuels such as cardboard, rotten wood, hessian, twine, burlap, pine needles and stringy bark. Indian beekeepers often use coconut husk, while sumac bobs (the clusters of fruit produced by a group of related flowering plants common in subtropical and temperate regions) are favoured by others because they produce substantial quantities of smoke without odour. 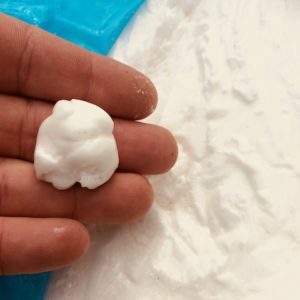 Paper pulp and compressed cotton are also commercially available through beekeeping suppliers. Although there are a great many modifications to the basic design, the principles are the same. The fuel smoulders slowly in the burner due to a limited supply of oxygen. When the small attached bellows are squeezed, this injects a blast of fresh air, keeping the fire alight and resulting in a puff of smoke. The smoke must be cool, as hot smoke and sparks will only agitate the bees. Nevertheless, the burner can become very hot, and it is therefore often encased in wire mesh or a second, outer skin to safeguard against burns. If extinguished and reignited as required, one load of fuel may last several hours, or even days. 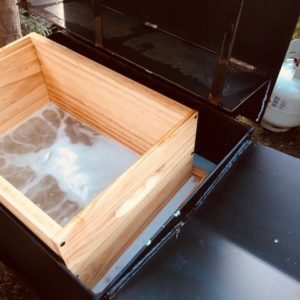 In their guide to safe beekeeping practices, Agriculture Victoria recommends the usage of a smoker with a barrel diameter of 100mm to provide a dense stream of cool smoke. In Melbourne and Victoria, bee smokers must not be used on days when a Total Fire Ban is in force, unless a specific permit is granted. Further information can be obtained from the Country Fire Authority by telephoning 13 1599 or from their website at www.cfa.gov.au. In addition, because bee smokers are deemed to be a ‘fire in the open’, restrictions apply to their usage in Victoria during a declared Fire Danger Period of Fire Restriction Period. Smokers must only be lit on ground that is clear of combustible material for three metres, or in a fireproof receptacle. The smoker must also be placed in the fireproof receptacle when not in use. A knapsack or water extinguisher, with at least nine litres of water, together with a hoe or fire rake must be on hand, and a person must be in charge of the lit smoker at all times. Agriculture Victoria also cautions against opening a hive unless smoke has been first applied. Several puffs of smoke should be aimed into the hive entrance, and then a few more after an interval of about a minute. 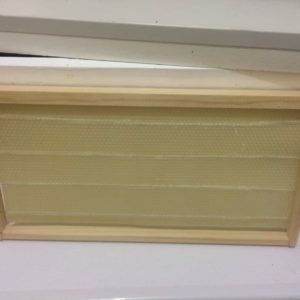 Once the hive has been opened, more smoke can be used as required, especially if bees suddenly start to fly upwards, which indicates that the effects of the smoke are wearing off. The beneficial nature of smoke is such that professional beekeepers can often work without protective clothing if smoke is employed. If you are stung whilst working with bees, you should immediately direct some smoke on to the site to conceal the pheromones that would otherwise encourage more bees to sting you.